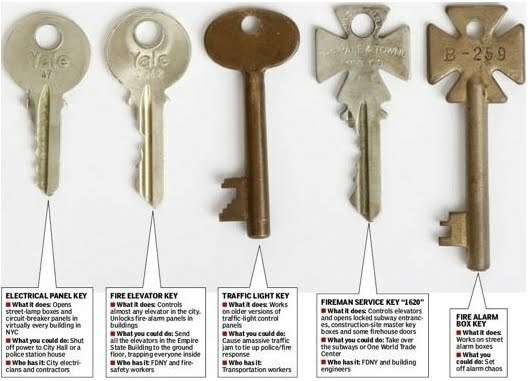 [Image: The "keys to the city," via the New York Post. One key description reads: "What you could do: Take over the subways"]. A set of "master keys" to the infrastructure of New York City popped up on eBay last month, leaving many public commentators and city officials alike concerned for the safety of the metropolis. One thing I mentioned last month during the "Applied Topology" lecture at UC-Berkeley was the potential to produce 3D replicas of keys based simply upon visual documentation of the target key set. For instance, research by Tamara Denning, Cynthia Matuszek, Karl Koscher, Joshua R. Smith, and Tadayoshi Kohno at the University of Washington—see this PDF—has suggested that "household robots," in their words, could be used someday to commit home burglary. 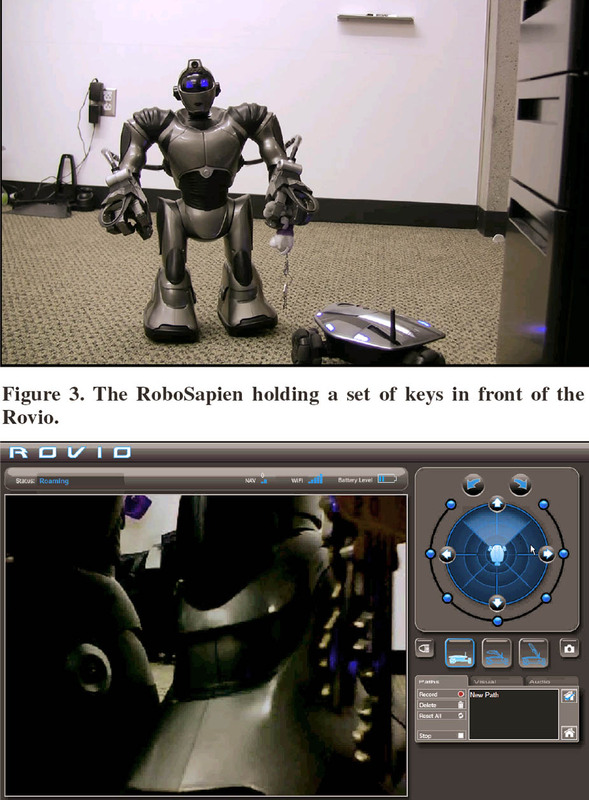 In a situation as notable for its comedic potential as for its criminal ingenuity, belligerent hackers could thus wirelessly take control of your "household robots"—Denning's group chose the Robosapien, Rovio, and Spykee for testing—and surreptitiously gain access to information about your house. Room layout, location of motion sensors, whether or not a certain door has been locked at night, if anyone is even home, or, more directly, where certain things, like jewels, cash, pharmaceuticals, or a handgun, might be kept. The most plausible scenario the team came up with involved something like a robot still-life, an American Gothic with keys: the Robosapien would simply grab ahold of your house keys and the Rovio would then sit there filming it. [Images: From research by Tamara Denning, Cynthia Matuszek, Karl Koscher, Joshua R. Smith, and Tadayoshi Kohno at the University of Washington]. All of which is a long-winded way of saying: surely someone could now produce, given enough dedication and perhaps a metal-based 3D printer, hypothetical copies of these "keys to the city" and shortly find him- or herself clicking open locked subway doors, turning off streetlights, stalling elevators, even redirecting construction site equipment to produce off-kilter towers in midtown? Using nothing more than a few glimpses of the keys found online and some late-night field-testing, the keys are cloned and begin to proliferate. After all, this is now the era of 3D-printed crime: 3D-printed machine guns, 3D-printed bomb triggers, 3D-printed burglar's tools. 3D-printed lock-picking kits, with near-universal access to the city, from elevators to subway cars to private apartments, can only be, worryingly, a few years away. Robots breaking into your home? This scenario coming to a theater near you! It's not a few years away. The technology to copy a key from even a distant blurry cell phone photo has been around for years. But with these keys scanned flat, each serving as a size reference for the each other... Forget 3D printers. All you need is a metal file and a little patience. I had a snotty Fireman buy a fireplug wrench from me once. I'd forgotten what it did - my father had passed away more than thirty-five years earlier, leaving it with me - and it's not like they're hard to replicate with a jar opener. You just have to realize that these keys are for convenience, not security.